Today was cage-cleaning day, and so naturally it was also photo day. 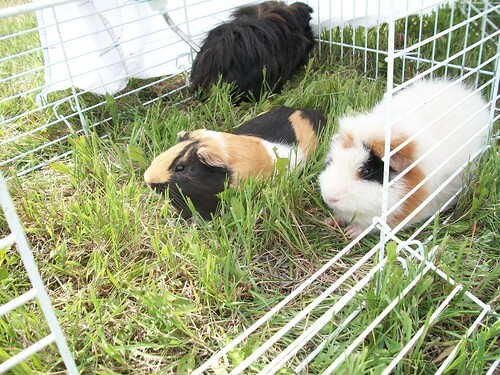 The boys live in a 3x5 C&C cage with a divider to make it a 3x3 and a 2x3. Batman lives alone in the 2x3 and the brothers share the 3x3. This is due to fighting, which I will share lots about later, I am sure! The funny thing is that they get along pretty well during floor time. I set up a pen in the kitchen and have finally clued in to putting a towel in the middle with veggies on it for them to share. The pen is about 16 grids circumference, and the grids are joined with zip ties into two long strips of grids. When I put them away, I have two zig-zag-folded piles of grids. This means that there are two potential openings in the pen, but I overlap the end grids and the boys have been pretty good. 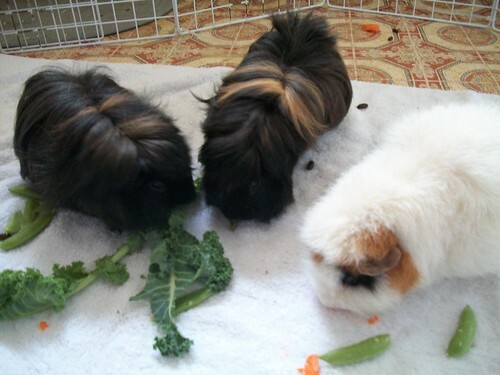 And all three of my boys chowing down together. From left to right, that's Squeak, Bubble, and Batman. Squeak and Batman are my trouble boys; they're the two who fought the first time, and Squeak's the one Batman keeps trying to bite in the head. (Yes, he did it again today. Little brat. 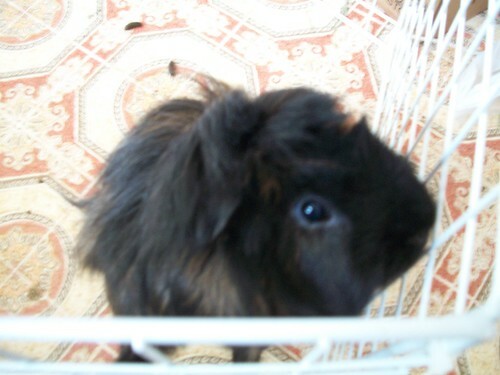 It's a good thing Squeak has so much hair!) 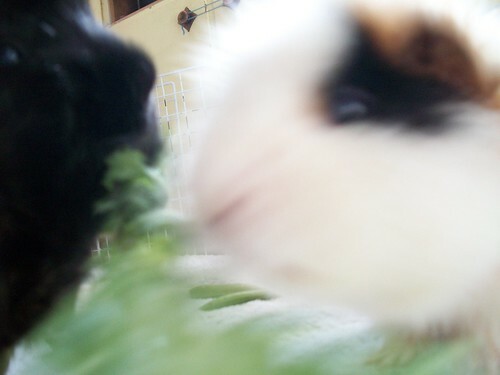 Here is Squeak stealing some kale from Batman. 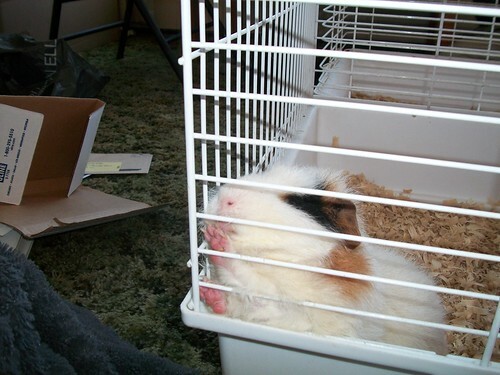 Of course, if you saw my post here, you'll know that Bubble's favourite place to be is in his cage. He is not a fan of floor time or lap time and mostly just wants to go back to his cage. Well, I have to say... I have a VERY smart guinea pig. He found one of those potential openings today and got himself out of the pen! 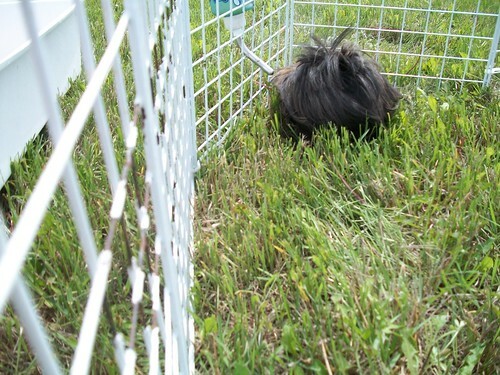 I turned around from being nearly done putting the fresh fleece into the cage and found a little black (okay, LARGE black) guinea pig beetling toward me! He was pretty easy to catch, thank goodness, and so I popped him back into the pen and then grabbed the camera immediately so I could get video of him escaping again. The second time, he brought Batman with him. I put everyone back where they were supposed to be and wedged the opening up against the cupboard so they couldn't get out while I was grabbing some of the cap joins from the grid sets. I came back to find that Bubble had managed to get it a little open and Batman had tried to get out but part of the pen had shifted so he couldn't actually go anywhere. I popped the cap joins on at the opening they'd found and put a couple on the other opening. I guess I'll be using them from now on! The boys finally have a chronicle! Yay! I thought I'd tell you about how I landed up with my Batman. Once upon a time, I had a Guido. Guido was very cute and very little. I got him from a friend who couldn't keep him anymore (they were moving and had to give up a lot of their animals at the time but found good homes for everyone). Guido was very small. He was about 18 months old when I brought him home on August 21, 2008. He weighed around 700g at the time and never really got much above that. 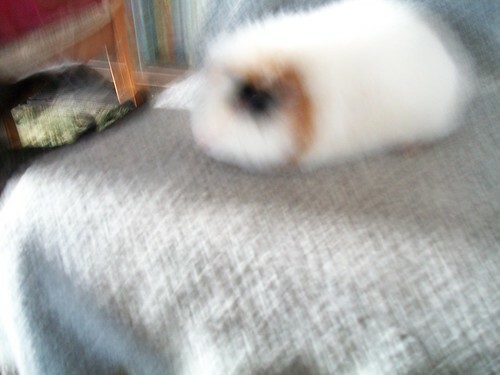 I think once when I weighed him he was 1000g, but mostly he hovered around 800-850g. 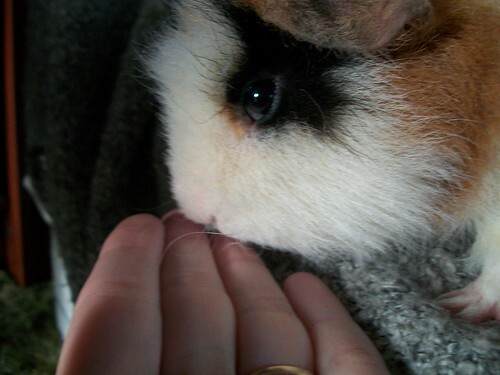 I also had an Isabella, but she died unexpectedly in January 2010. So Guido was an only-pig for a year and a half. I wanted to get him a friend. I don't work outside the home, so I did spend a decent amount of time talking to him and stuff, but I really felt that he would like to have a friend who wasn't a cat. 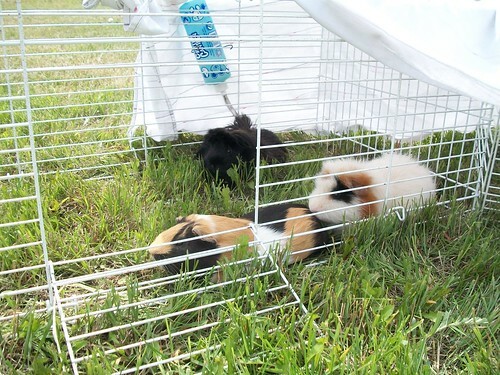 I convinced my husband that three guinea pigs really wouldn't be that much more of a hassle than two (two was supposed to be my limit) and I had three "large" cages anyway, so it's not like there would be any extra expense or anything to get set up! So he said I could adopt Batman and Robin. I brought them home at the end of July 2011. The records at the SPCA said they'd been surrendered because the original owner "had too many." They were just babies when they were brought in, I guess about a month old, and that had been at the beginning of December 2010! The people at the SPCA had tried to keep them socialized to humans, handling them often and all the rest. I couldn't believe NOBODY had adopted these two cuties before I came along! They were nearly nine months old, and they'd spent most of their lives at the SPCA! As you can see, the boys were both teddies. 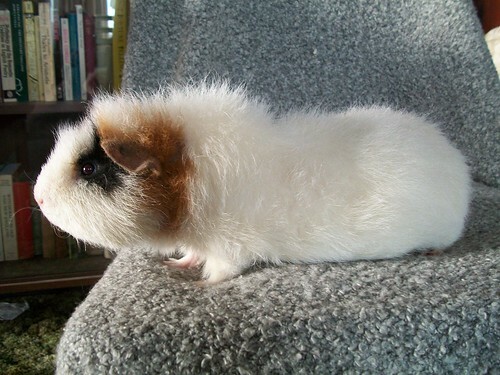 I'd never had teddies before - all of my previous guinea pigs had been Americans and Abbys, though a couple had longer tufts here and there, and at least one was a crested pig. Batman didn't like the aspen shavings; they'd had pine at the SPCA, and of course it's softer than aspen. Unfortunately, the day after I brought them home, Robin was obviously unwell. I took the boys out for some floor time in the living room (quarantine well underway, so no Guido yet) and Robin sat in one place the whole time. He didn't even eat any treats. 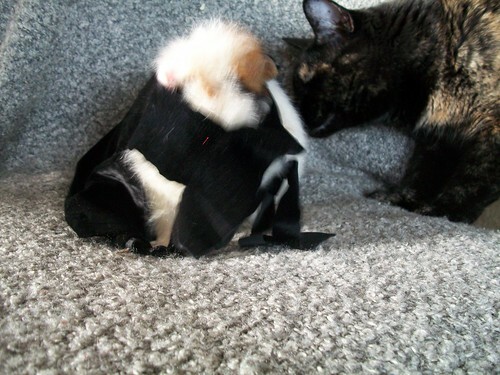 Meanwhile, Batman was running around exploring and even came over to check out his brother and make sure he was okay. He was breathing heavily and had a little discharge at his eyes, but nothing from his nose and he wasn't really rattling the way I would have expected from a URI. I gave Robin some Critical Care (he ate it pretty well) and put him in a small cage with a towel for bedding, in my bedroom. We had to go out for the afternoon for a couple of hours, and when we got back he was gone. Poor baby just curled up in the igloo and went to sleep. Nothing painful, nothing bad, just asleep. It was a long weekend, so no vets and I hadn't found a local exotics vet yet so didn't know where to take him at all. I figure he was a heart pig and it had gone completely unnoticed. Probably the stress of moving just sent him right over the edge. I don't know that anything could have been done, he was so far gone that morning. He's buried out near our copse of trees behind the house. We have a mini guinea pig graveyard back there, with rocks marking the graves (always a big one right on top, to discourage stray dogs from digging). I got Batman in to see the vet - which is now where I take all of my pigs, and will be taking the cat for her shots soon - to make sure he didn't have a URI (he didn't). I also called the SPCA and let them know what had happened so they could get the other animals who'd been in the room with Batman & Robin checked over by a vet for any infections. And I took Guido in to see the vet a few days after Batman got his clean bill of health, because I wanted to make sure my little man was healthy. And so I had Guido and Batman. They stayed separated for the full two weeks' quarantine, just to be sure (in case the vet missed something). 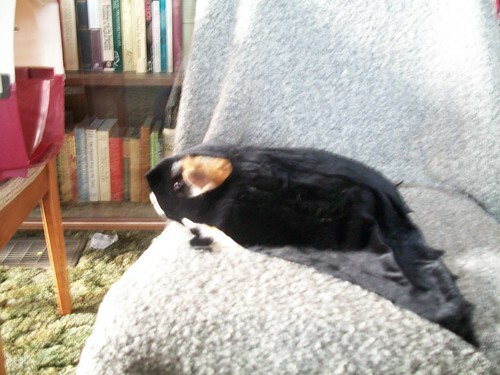 Batman loved floor time in the living room. 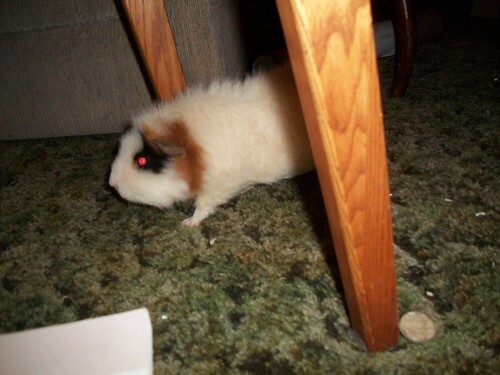 He was really active whenever I let him loose, running all over the room (and it's a big living room). He popcorned constantly - something I honestly don't recall seeing past piggies do, except for maybe Katonia, who was my "Valley-Girl" piggy. And that is how I got Batman. I'm sure there will be other current stories to come this week, and maybe next week I'll tell you how I lost my Guido. It's hard to tell the stories of the current boys without explaining the most recent losses! Just realized I should note that when I said Robin didn't eat any treats, the treats were fresh veggies that I offered them during floor time. Batman scarfed his down (like he does now) but Robin wouldn't touch his. 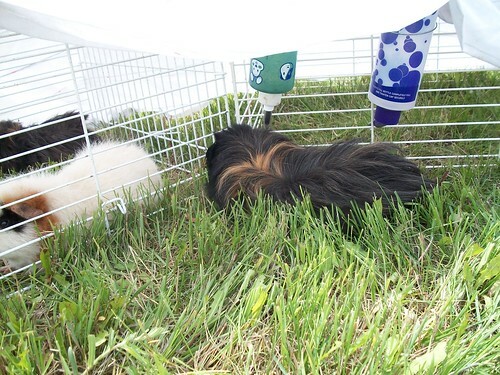 I knew they'd been getting fresh veggies at the SPCA (saw them in the cages), so it wasn't a case of unfamiliarity. Poor guy just felt like crap. I'm sorry about Robin, he was a sweet little boy. I love Batman's black eye patch! 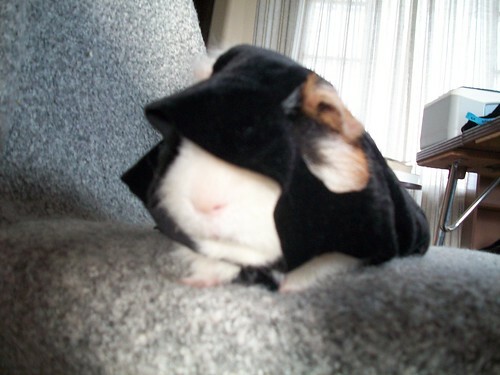 My abby sow is similar to Batman as she too has 1 back eye patch. However, the rest of her is white. Sorry you lost Robin but you new boys, Squeak & Bubble are adorable, although boarly, ha ha. Last week on Wednesday (April 25), I left for Calgary so I could see some friends and attend the Calgary Comic & Entertainment Expo over the weekend. I returned on Tuesday (May 1). My husband looked after the boys while I was away. I knew he wouldn't want to have to spot-clean (or fully clean) the cage while I was gone, so I changed it out completely to pine shavings (yes, kiln-dried) before I left. I also wrote out detailed instructions regarding their menu, which wasn't followed to the letter but at least they had everything they needed as often as they needed it (just the veggies were in different quantities/mixes). Adam West was there. (The original TV Batman from the 1960's.) I got his autograph. And a bit more of something. It's Batman's story, and he'll be writing about it on the blog today, but here are some photos and my version of the story. When I found out that Adam West was going to be there, I decided that I had to make Batman a cowl and get a photo to give to Mr West. For whatever reason, that version of Batman is always the one that comes to mind first when I hear the name, and of course the names were the whole reason I adopted Batman and Robin in the first place. AWE great Chronicles. I look forward to more. Please excuse my huge nerd-girl squee at the thought of meeting Adam West and giving him a photo of your Batman. Your boys are stunning and I'm loving their chronicle. I can't believe Adam West took your picture of Batman! :O That is so freakin awesome! I weighed the boys today. Batman gained 37g in a week. My boy is now 1335g. Not yet square, but getting to where it's hard to feel his spine, so I'm going to cut back on the pellets for the next week and see where that gets us. I picked him up and knew immediately he was heavier than he used to be. Which is hilarious, because he's still lighter than the brothers, and he felt heavier! Bubble gained 15g. He now weighs 1388g. That's still lower than his highest weight thus far, so I'm not worried about him - well within the realm of normal for him! Squeak lost 6g. He's still well above his lowest weight, sitting pretty at 1436g (compared to 1419g), but he lost 21g in two weeks (April 19-May 4) last time. 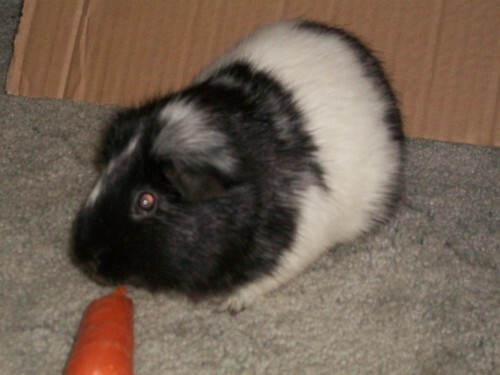 With that and his new bald spots (see the latest update to his medical thread), I'm wondering if Bubble is now Top Pig and isn't letting him eat as much as he used to. They are blissfully unaware of Sandy and H/B, the rescue pigs who are currently living in the TV room in the basement (there is a TV in there, but it is currently on its side on the floor and we do not use it). This is a good thing, since Sandy is a girl and the brothers would probably start really fighting then. No picture today, as I have been so busy with Sandy that I didn't have time to do any photos at all. Hopefully next week I will have lots of photos to share. I hope to capture Batman with his morning veggie bowl at some point, too, because it is really funny. He actually digs through to find his carrot (he knows he always gets a baby carrot with his breakfast). Doesn't matter what else is in the bowl or what's on top, he finds it! Saturday everyone (sans Sandy) got to go outside and play together! It was a roaring success, and I am more certain than ever that Bubble would really prefer to live alone, and that Batman and Squeak might be best buds someday soon. I set up a pen in the yard and used cage tops as walls in a few places. I used kitchen twist ties to hold things together temporarily. This photo is before I got the sheet set up to provide them with shade - don't worry, I didn't leave them in the sun for long! Bubble's first action (after he said hi to H/B) was to check the perimeter and see if he could get out of the pen by going under the grids. What a stinker! He didn't succeed, of course. When I got the sheet set up, everyone congregated underneath it. They were hilarious. The little guy seemed kinda lonely, so I did eventually take him out of his solitary confinement and let him go hang with the big boys. I was apprehensive, but stayed close (in the pen) so I could rescue him if necessary. Happily, it wasn't necessary! Eventually I decided he needed a break from all the rumbling (and from Bubble getting snarky whenever he got close) and put him back in his cage top. Batman proceeded to come and talk to him, so I left the door open and Batman figured out how to go say hi in person. Squeak followed pretty soon afterward. What was really funny was that Squeak mounted Batman a LOT but that was the only mounting that happened the whole time. And every time it happened Batman had this look on his face like, "WHAT just happened to me?!?!?" 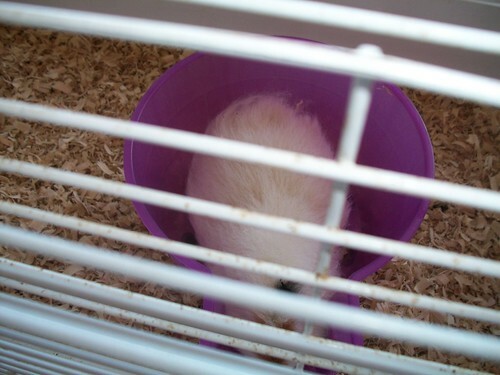 Bubble mostly stayed in the first cage lid, but he did come say hi at one point and even went in for a little while. He really is a loner, though. After all that rumbling, the three boys needed a rest. They all laid down and got comfy together. 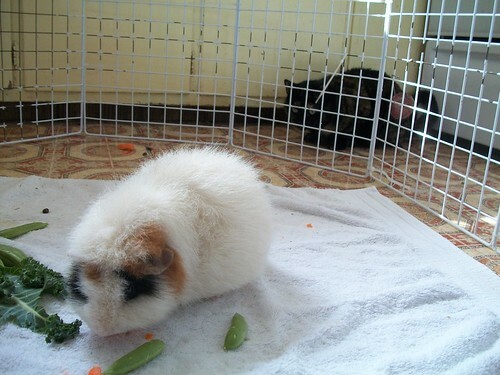 When I brought them all back indoors, they flaked out in their cages and got lots of rest. They were obviously exhausted. We did have to perform minor surgery on Batman, as he wound up with a tick on his ear. Nobody else got one this time, though! How cute! First picture, I kept thinking, "WARNING WARNING WARNING - NO COVER!!". I almost think the picture should have a written warning on it! 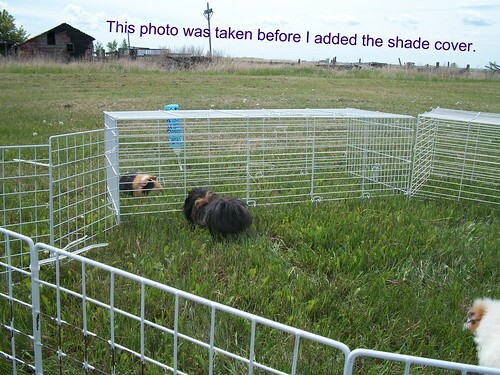 ("Photo taken before shade cover applied") Glad you clarified that but I still worried! There. Not sure if/when the new version will show up in the post, but I found out that Flickr has added a photo editor, so I put some text on the photo and added some info in the description. 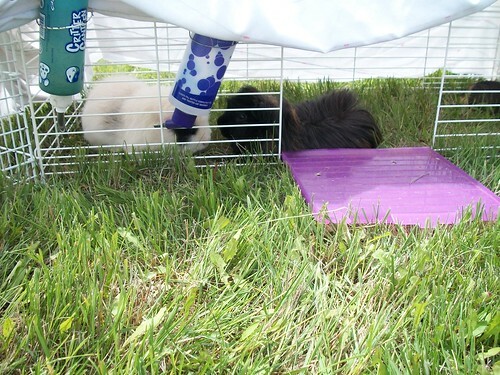 "Guinea pigs should NEVER be outside without someplace to go for shade - the sun can cause serious problems for them! 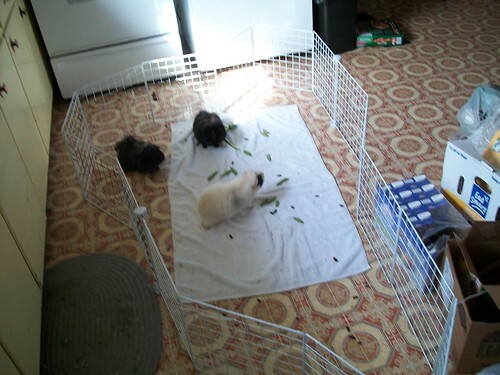 I added a sheet over the cage tops, and you can see that in some of the later photos from this group."